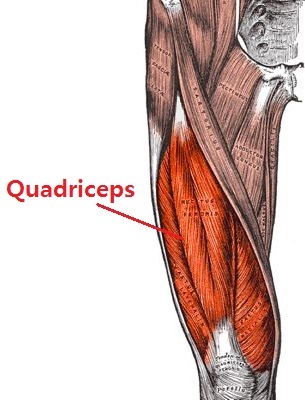 The quadriceps is a group of several muscles (including four large muscles) on the front of the thigh (the upper leg above the knee). Squatting down and lifting a weight off the ground by straightening your legs. Starting a seated position, lifting weights by raising your feet from the ground. Starting a seated position, pushing a weight away from your body using your feet. Exercises which involve positioning one leg forwards and one leg at the rear. Squatting down with a weight held across the upper back, and then lifting the weight by standing up.